Back in 2004, at 21 years old, I literally woke up one day, changed everything about the way I ate and joined the gym a few blocks from my New York City apartment. And, over the last 9 years, I never once reverted to my previous daily diet of greasy take-out and fast food (though I’m sure McDonald’s chicken nuggets and Pizza Hut breadsticks are still delish). See, living on my own post-college finally provided me the space I needed to embrace the fact that I was gay and begin dating. My aforementioned diet (and its effects on my body) wasn’t exactly helping my confidence when I was already self-conscious about my sexuality. So, I decided to make a change — something I could control — and altered my mind-set. This whole idea of “eating clean” and working out was surprisingly simple and I saw instant, affirming results. And then it got complicated. Throughout my twenties, I inched closer to the “disordered eating” lifestyle which is basically a wide range of irregular eating behaviors that do not warrant a diagnosis of a specific eating disorder like anorexia or bulimia. I became increasingly restrictive (read: obsessed) with what foods I deemed “clean enough to eat” and began exhibiting some of the physiological symptoms of under-eating/nutrient deficiency, like thinning hair and disruption in my menstrual cycle. There were birthday parties and weddings I spent avoiding the catering, convincing myself I wasn’t hungry and setting myself up for the inevitable binge on the sugary sweet foods I absolutely loved. Trust me, the body is a lot smarter than the mind and it will get the calories it needs one way or another! Interestingly, my relationship with the gym has been nothing but productive and I was never an obsessive cardio bunny (you know, the girl you see on the same elliptical year after year, her body never changing). I fell in love with a bodybuilding-esque training style and am proud to say I never spend more than 30 minutes at a time doing cardio. Desperately searching for answers and a way to end the perpetual rollercoaster (that was now affecting my relationship with the woman I loved), I was innately drawn to holistic nutrition and training blogs, coaches and YouTube channels. Using the knowledge I gained, I slowly reverse-dieted my way into metabolic repair and am currently eating more food on a daily basis than I have in the last 10 years(! ), surging my metabolism and feeling more at home in my own body than ever before. I realized that food is medicine and if I got myself into this mess with food, I could absolutely heal with energetic, wholesome superfoods in quantities that would eliminate my cravings and calm my mind. Finally free from the metaphorical chase from my own body, I decided to follow my ignited passion for nutrition and fitness and become certified as a Holistic Health and Nutrition Coach and guide the countless women (and men) out there who struggle with various permutations of my own story. I received my cutting-edge nutrition training through the Institute for Integrative Nutrition, where I studied the major dietary theories from East to West, including Ayurveda, Macrobiotics and Blood Type as well as a variety of practical lifestyle coaching methods and now help people create a completely personalized roadmap to health that suits their unique body, lifestyle and goals. My mission with this new column is to inspire, educate and empower you to become a rockstar in your body and mind. Jessica Rothschild is a Holistic Nutrition + Fitness Coach helping people create a completely personalized roadmap to health that suits their unique body, lifestyle and goals. 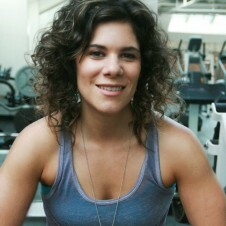 Jess offers private coaching specializing in deconstructing cravings, disordered eating and personal training. Her mission is to inspire, educate and empower people to become rockstars in their bodies and minds. Check out her work at www.facebook.com/caketokale.com. Posted June 12th, 2013 & filed under Health. So proud of your new adventures and attitude on life. Love you so much! I’ve “Liked” your Facebook page. Will your blog be posted there, or how do I subscribe? I’m in a mid-life crisis ready to make permanent change and I need all the inspiration, knowledge and motivation I can get! Thank you! Yes, my blog posts will be posted on the Cake to Kale facebook page as well as my web site (www.caketokale.com) . Shoot me an email at caketokale@gmail.com and let’s talk.